Viraj was one of our summer interns at Lyve Minds. During his internship he and one other person took on the herculean effort of localizing a code base in which neither had much prior experience working in that particular stack. That project could not have run smoother. Viraj is a ferocious self learner, and approaches projects with an almost infectious enthusiasm. 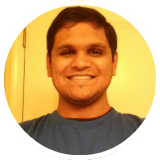 Viraj joined us in early 2012 as a Web Development Engineer. He is a quick learner and a hard-working professional. I found him very comfortable working in a startup environment as he actively contributed to various feature discussions. He is knowledgeable in Ruby on Rails and well-versed with Linux and Git workflows. He also closely monitored our Google Analytics Dashboard to find site usage patterns. He is enthusiastic about his work and is a team player. I wish him all the best! Viraj was a 2011-batch Comps PVPP ex-student. I have taught him Computer Networks(both, CN and ACN) and I can say he was one of the brilliant students of his batch. In college, he has participated and helped organise events like C/C++ workshops and paper presentations. As student he was always inquisitive about theory as well as practicals. Also, he has participated in WikiConference 2011 and Wikimedia Hackathon this November. He has contributed to Marathi and Gujarati onscreen keyboard, and some other tech tracks, with International developers. I wish him all the very best for his future prospects. Viraj is highly active student. Always participates in all tech activities. Good team player, Obedient, hard-worker. Please do not contact me with contract, temporary or part-time opportunities. © Viraj Kulkarni. All rights reserved.